Why Does My Dentist Want To Use Silver Amalgam Fillings? Composite filling in a premolar tooth. Silver (amalgam) fillings have been used for more than 100 years, they are safe, reliable, effective and hard wearing. There has been rumours over time about the safety of amalgam fillings, but like many rumours, these are unfounded and lacking scientific evidence. A question we are often asked in the clinic is whether our amalgam fillings should be removed. Amalgam is a great product that has stood the test of time and is still used today. There were discussions that mercury was leaching out of these older fillings but the scientific evidence is that this doesn’t happen in any significant amount. There were also discussions that amalgam cracked teeth. This again was found to be untrue as any disruption to the tooth structure weakens it and can create cracks regardless of the filling in the middle. 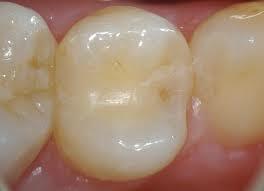 An amalgam with no fracture lines, chips or decay is in our opinion, perfectly fine to leave as is. Removing a filling takes more tooth structure as well. The alternatives to amalgam are tooth-coloured products like composite resin or ceramic products. Composite resin is much more technique sensitive, much trickier to close gaps in back teeth and must stay dry while it is being placed incrementally. The resin products are getting stronger but they are a bit more brittle and do not last quite as long as amalgam. They can also de-bond from time to time. The ceramic options are usually two stage procedures requiring impressions and more time to do. The ceramic solutions are very strong, very pretty but much more expensive. The ceramic is then cemented in place. Dr Stone keeps asking the chemical engineering students for a white amalgam! How do I choose the right type of filling? Discuss any concerns you may have with your Dentist. They will be able to discuss all your restorative options to return your tooth to optimal form and function. Determine the pros and cons of each material and what will work best for your tooth. Latest news from the Adelaide City Dental Care team. The weather in Adelaide has been a little warm this summer so we hope you are staying cool and hydrated. The city has played host to the 10,000 Scouts from around Australia and some internationals as well, the cricket at the Oval and the Tour Down Under. We even had a visit from a patrol of scouts with one member in discomfort. We were able to supply her with what she needed before her return to the Tailem Bend campsite. She really couldn’t have come to a more scout/guide friendly dental surgery really! We were very happy to help. Keep cool and we will see you in the surgery!